After the success of MM Party Treats, now am very pleased to annouce AWED-Brazil. AWED is an wonderful event started by DK of Chefinyou, its an excellent way to explore international recipes. I would like to thank DK for giving me an opportunity for hosting this event. Brazil is a large country that is made up of many different cultures. Each region has a different food specialty. The Portuguese arrived in Brazil in 1500 and brought their tastes and styles of cooking with them. They brought sugar, citrus fruits, and many sweets that are still used for desserts and holidays. The Brazilian "sweet tooth" was developed through the influence of the Europeans. Brazilians use many eggs, fruits, spices (such as cinnamon and cloves), and sugar to make sweet treats, such as ambrosia. They also use savory (not sweet) seasonings such as parsley and garlic. Other nationalities that settled in Brazil were Japanese, Arabs, and Germans. More than one million Italians had migrated to Brazil by 1880. Each immigrant group brought along its own style of cooking. Long before the Europeans arrived, however, the Tupí-Guaraní and other Indian groups lived in Brazil. They planted manioc (a root vegetable like a potato) from which Brazilians learned to make tapioca and farofa , ground manioc, which is similar to fine breadcrumbs. It is toasted in oil and butter and sprinkled over rice, beans, meat, and fish. As of 2001, farofa was still used as the Brazilians' basic "flour" to make cookies, biscuits, and bread. Rice, black beans, and manioc (a root vegetable like a potato) are the main foods for many Brazilians. You can browse Wiki for more information. 1. Prepare any Vegetarian dish from Brazil and post between now and 31st Oct (Only vegetarian no eggs please). It can be anycourse of soups, meal, snacks, starters, sweets, desserts, baking is also allowed. 2. Please linkback to this event announcement and DK's page. Use of Logo is must. 3. Email me at simplysara07@gmail.com with Subject: AWED-Brazil mentioning the following details. 7. 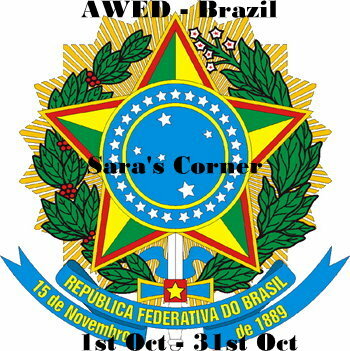 Round up will be posted in Nov.
Hope you like participating @ Sara's Corner Events. If you have any questions, feel free to mail me or leave a comment. Never tried any recipes from Brazil, nice choice. Can't wait to explore a new cuisine. Happy hosting, will send my entries soon.. Completely a new idea for me. I will have to ask my Brazilian friends for some veggie recipes. Nice unique event.Shall try and send in a post.